Can you believe that Valentine's Day is only a little over a month away? So I thought I would share my new Valentine wreath to give you a head start in case you would like to make one, too. It was fun and easy…and stay tuned because you are going to see it again! I am adding it to my Valentine mantel...a first for me! …when I discovered a basket full of sweater-covered Christmas ornaments at Hancock Fabrics…on sale at 80% off or about $1.00 each…and some of them were heart-shaped! Score! However, it would be easy to make these from old sweaters as well…but why reinvent the wheel? Wrap the straw with the burlap strips, stapling them as you go. Be sure to start and end each strip on the back of the wreath so that the front has a nice finished look. Create your fabric hearts or use purchased hearts. The number that you will need will depend on their size. I tied off the yarn hangers on mine into a little bow. Place your hearts on the wreath, spacing them as you wish. I alternated the direction of the points of the hearts. Then, hot glue them in place. Finally, I tied some jute twine around the top of the wreath and created a loop on the back so that I could hang it. And…taaa daaa!…here it is! I like the rustic farmhouse look and the contrast of the textures. For me, it says Valentine's Day without being too cutesy! 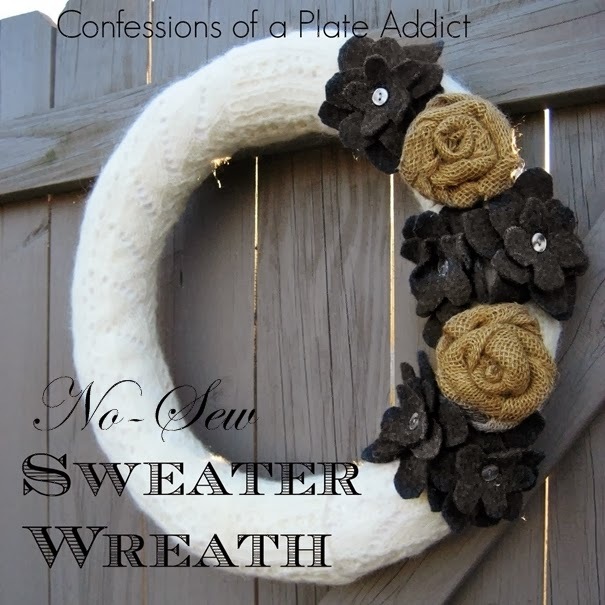 Here's another fun way to make a wreath using a sweater...and this one is no-sew, including the fabric flowers! Find out how to make it here. And just in case you are looking for some more Valentine's Day inspiration, check out some of my favorite projects here. Also…be sure to stay tuned to see my Valentine mantel starring my rustic farmhouse wreath! Thanks for stopping by! I hope you enjoyed seeing my Valentine wreath! Please visit these wonderful bloggers and their beautiful blogs to see what they are up to and to find a list of this week’s participants! Love all of your projects. Just love the wreath. You are so gifted. Hope to catch up more now that I am a follower. Oh that is really cute! I have been looking for a wreath for Valentine's Day.....but I would have to make the hearts! That wreath is adorable, Debbie! Debbie, this is the cutest Valentine's wreath! It isn't too cutsey and is very winter/valentine appropriate! I am pinning this and you know I love all those pillows of yours! Amazing! I love the simplicity! Beautifully done. This is so cute. The perfect Valentine's wreath, Debbie. And the perfect Valentine boy... Baby Kitty just begs to be hugged! Love that kitty boy so much! Love, love, love theheart wreath, going to make one, those hearts are so pretty....I also ADORE your kitty pics! That is an adorable Valentine's Day wreath! I'm going to have to give it a try! Your cat is precious too! Adorable wreath! What a relief that I don't have to make the hearts. :-) This will be a quick and fun project! Thanks for sharing. Looking for inspiration for Valentine's Day and I always come to the right place for it!…Love the wreath!!! Love it!! I'm going to make my Valentine wreath this year, and you gave a nice inspiration. TY! !